Plaque develops when the sugars and carbohydrates from food mixes with the bacteria already present in the mouth, forming an acid. Plaque is a sticky, colorless material that is easily removed from the tooth surface by brushing and flossing. If plaque is not removed it can erode the enamel of the tooth and reach the dentin. Dentin is much softer than enamel and will succumb to deterioration rapidly. 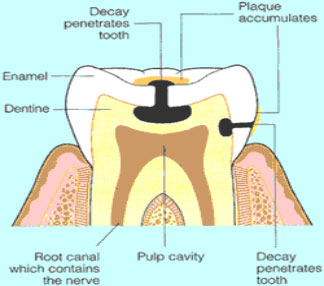 Once decay eats through the dentin it can damage the pulp and will eventually cause a complete loss of the tooth. Cracks, pits and grooves in the back teeth are especially vulnerable to plaque formation, and therefore decay. They are difficult to clean and easily trap debris and bacteria. Areas around prior restorations are also more likely to trap plaque, leading to decay. Dental caries (cavities) are difficult to detect at first. They may begin as a small white spot that develops into a pit overtime. The length of time it takes for a cavity to progress varies by person and is dependent on chemical make-up, diet, habits and oral hygiene home care. The small white spots that have not yet eroded the enamel can be reversed if the plaque is removed and the enamel is allowed to heal. A fluoride treatment can be applied to the weakened area to increase the strength. The dentist will determine which fluoride treatment will be the most beneficial. If the decay has progressed through the enamel a restoration, filling, will be necessary to repair the damage. The dentist will remove the decayed portion of the tooth and fill the hole with a resin material that matches the natural color of tooth. If the decay has reached the pulp of the toot, root canal therapy may be necessary. During root canal therapy, the dental pulp is removed from the tooth and the canals are filled with a material called gutta percha. A crown is usually required following this procedure to strengthen the tooth and prevent fracture. The easiest way to avoid dental caries is to practice good dental hygiene. Having teeth cleaned and examined twice a year will also decrease the incidence of dental caries and ensure that any caries that do form are caught early, before significant damage is done.